Archduke Leopold Wilhelm governed the Spanish Netherlands, a job he was completely unqualified for BTW. But being Archduke turned out to be a super profitable job. So he gets to thinking, what better way to spend all this government dough than buying more art than the walls can hold? In the mid-1600s, David Teniers the Younger was hired by Archduke Leopold Wilhelm to be his painter and art collector. The poor Archduke had lost all of his artwork to looting Swedes, and instead of moping about it he decided to found the Vienna Picture Gallery. Teniers was hired as an artist and gallery curator, and was given the title “ayuda de camara” which means room attendant. Everything sounds worse in English. Despite the fact that the Archduke’s growing art collection led to Teniers’s cushy job, the painter still decided to paint a scene mocking his boss. The walls of art dominate over the little people who purchased them, implying that the Archduke’s spending was getting a little out of hand. You would think a painter would be down with a rich guy who’s obsessed with paintings, but life is full of surprises. Eventually, the Archduke’s situation in Spain deteriorated so he moved back to Vienna. Fortunately, he got to keep his gigantic art collection, so being an unqualified administrator wasn’t a total waste. 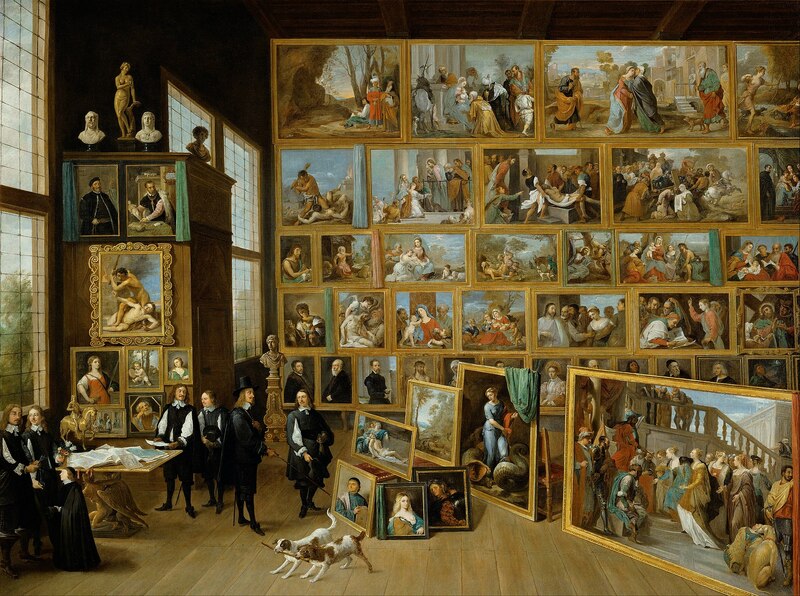 The painting shows the Archduke as a collector with friends admiring a set of paintings. The artist himself holds his hat in his hand and is listening to his patron as the archduke gestures with his cane towards some recent acquisitions. The paintings are arranged in rows on a rear wall, with several others on the side of the vestibule on the left, and a set that are positioned in the foreground leaning against chairs for inspection. This painting is a copy by the artist and one of the first that David Teniers the Younger prepared to document the Archduke's collection before he employed 12 engravers to publish his Theatrum Pictorium, considered the "first illustrated art catalog". He published this book of engravings after the Archduke had moved to Austria and taken his collection with him. It was published in Antwerp in 1659 and again in 1673. The original version of this painting, with the figures arranged differently, is in the collection of Petworth House, south of London. Check out the full Wikipedia article about Gallery of Archduke Leopold Wilhelm in Brussels (Vienna).